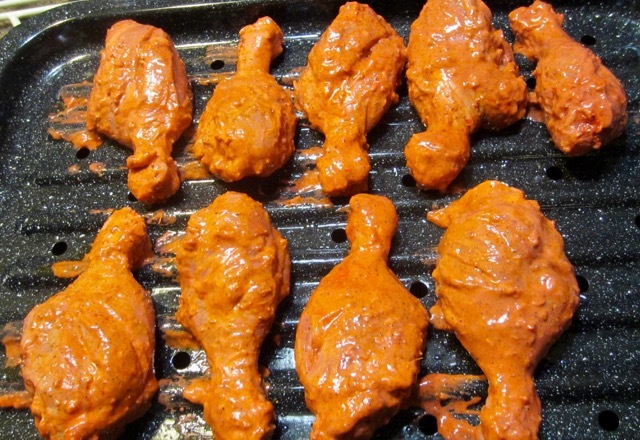 I had tandoori chicken for my dinner last night. I got this recipe from “Tandoor: the Great Indian Barbecue by Ranjit Rai” The chicken is supposed to be made in a Tandoor oven but obviously I don’t own one. 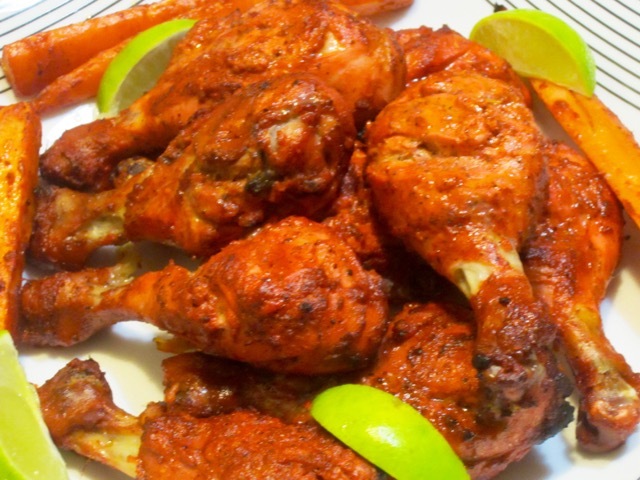 I went to you tube to see the various ways people cook tandoor chicken in normal ovens and am attaching the three videos I liked most at the end of this post. I used the method in the first video and it worked perfect. The chicken was moist and tender and perfect. We didn’t talk to each other during dinner. We just focused on eating the chicken. 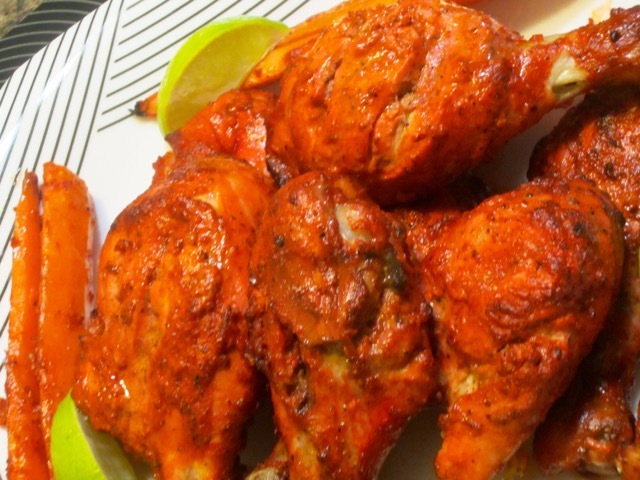 If you’ve never tried tandoor chicken I highly recommend you do.You can always adjust the level of chilli to your liking. Have a wonderful weekend, ahead! Mix ingredients of marinade 1 (lime juice, Kashmiri, oil, salt). Rub the mix all over the chicken and into the cuts. Set aside for 1 hour. 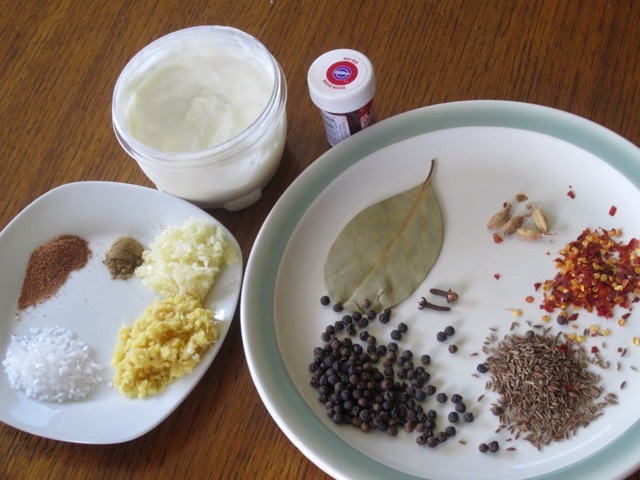 Grind all the dry ingredients of marinade 2 (bay leaf, cloves, cardamoms, peppercorns, caraway, dried chillies and salt). 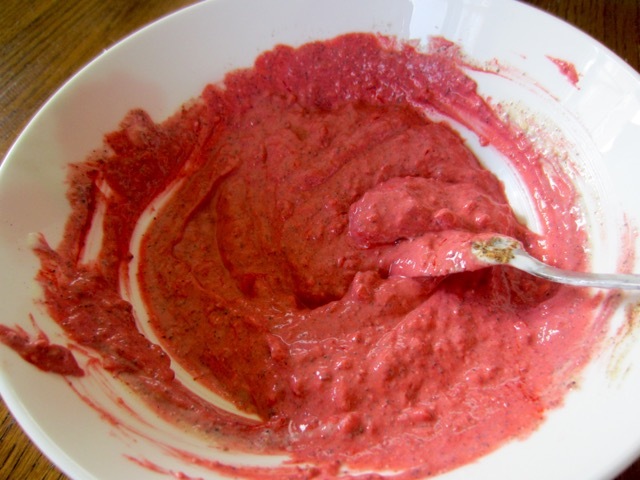 Mix the ground spice mix with the rest of the ingredients (yoghurt, ginger paste, garlic paste, mace, nutmeg and food colour. Stir to mix. Pour the second marinade over the chicken pieces. Roll the chicken pieces around by hand to mix them with the marinade. Leave in the fridge for at least six hour to overnight. Flip the chicken pieces at least once. The chicken was moist, tender and delicious. I shall be making this once a week! Preheat the oven to 450ºF (230ºC) convection. Lightly oil the top of a broil pan set. Set aside. Make at least 3 deep cuts on each chicken piece. 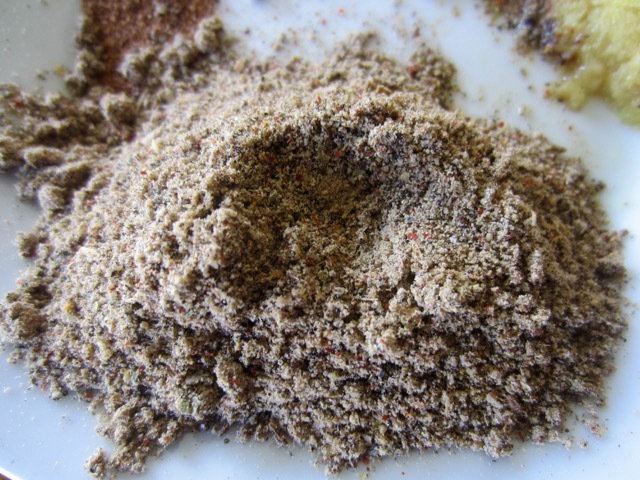 Grind all the dry ingredients of marinade 2 (bay leaf, cloves, cardamoms, peppercorns, caraway, dried chillies and salt). Mix this ground spice mix with the rest of the ingredients (yoghurt, ginger paste, garlic paste, mace, nutmeg and food colour. Stir to mix. Pour the marinade over the chicken pieces. Roll the chicken pieces around by hand to mix them with the marinade. Leave in the fridge for at least six hour to overnight. Flip the chicken pieces at least once. The yoghurt should be really thick. If not place it on a fine strainer or in a cheese cloth and let it drip for 2 hours before using. 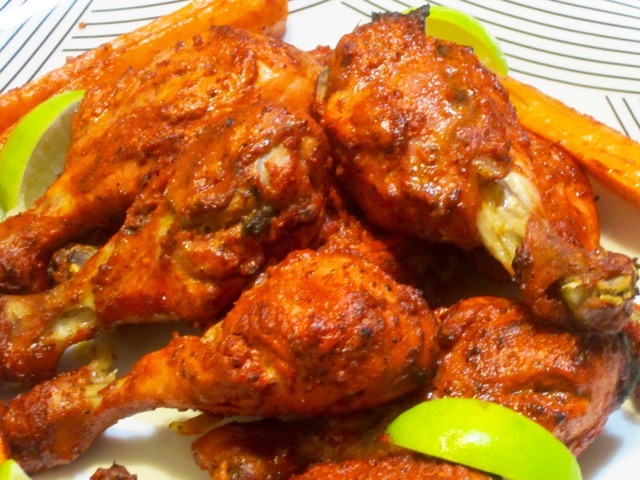 It’s highly recommended that you use Kashmiri Chilli Powder. You can adjust the amount of chilli pepper to suit your palate. 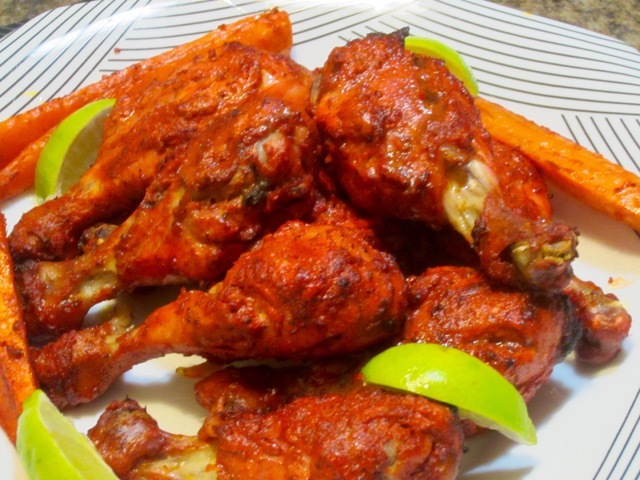 I love tandoori chicken. I make it at least once a week! I tried that trick. It works like a charm. Have a great week! Yes you can have all of it! So an interesting post Liz. I always thought the color of the chicken was from spices instead of food coloring…always learn something new. Oh yes if you lay your hand on Kashmiri chilli powder then you don’t need to use the colour. I still can’t find Kashmiri chilli so I used wilton red colour for cakes! ha ha! Now that looks appealing! I’m imagining the scents from making the spice marinades and then the cooking! I shall have a look at the videos later to see if it’s something I could handle! I’m on a mission today with it raining here…..my battery for little mower isn’t holding a charge, having trouble finding one, I need new weed whacked blades, and my old well loved mixer packed it in! I use it a lot. How are things going at your house Liz? Hope you get some down time for yourself this weekend! The weather is lovely today. 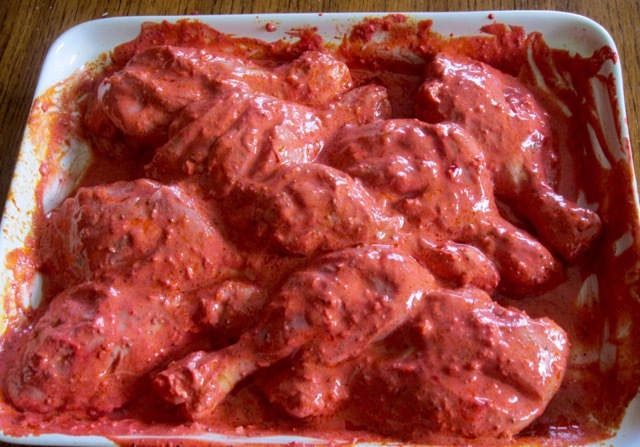 I’ve just finished the tandoori post and here you are. I can’t imagine rain today…but am sure you guys are used to rain in BC. That reminds me I should be mowing my lawn today or tomorrow. Why does grass grow so fast? just mowed it four days ago. Okay Sandy have a lovely day and hope you rind the battery. My stomach is growling. Gotta have some breakfast. I drunk some four glasses of lemon water now time for Masala Tea!